The First Balkan War (Bulgarian: Балканска война; Greek: Αʹ Βαλκανικός πόλεμος; Serbian: Први балкански рат, Prvi Balkanski rat; Turkish: Birinci Balkan Savaşı), lasted from October 1912 to May 1913 and comprised actions of the Balkan League (the kingdoms of Bulgaria, Serbia, Greece and Montenegro) against the Ottoman Empire. The combined armies of the Balkan states overcame the numerically inferior and strategically disadvantaged Ottoman armies and achieved rapid success. As a result of the war, the League captured and partitioned almost all remaining European territories of the Ottoman Empire. Ensuing events also led to the creation of an independent Albania which angered the Serbs. Despite having the greatest success, the main victor, Bulgaria, was dissatisfied over the division of the spoils in Macedonia, which provoked the start of the Second Balkan War. Tensions among the Balkan states over their rival aspirations to the provinces of Ottoman-controlled Rumelia, namely Eastern Rumelia, Thrace and Macedonia, subsided somewhat following intervention by the Great Powers in the mid-19th century, aimed at securing both more complete protection for the provinces' Christian majority and protection of the status quo. By 1867, Serbia and Montenegro had both secured independence, which was confirmed by the Treaty of Berlin (1878). The question of the viability of Ottoman rule was revived after the Young Turk Revolution of July 1908, which compelled the Sultan to restore the suspended Ottoman constitution. Serbia's aspirations to take over Bosnia and Herzegovina were thwarted by the Bosnian crisis and the Austrian annexation of the province in October 1908. The Serbs directed their expansionism to the south. Following the annexation, the Young Turks tried to induce the Muslim population of Bosnia to emigrate to the Ottoman Empire. Those who took up the offer were re-settled by the Ottoman authorities in districts of northern Macedonia where there were few Muslims. The experiment proved to be a catastrophe for the Empire since the immigrants readily united with the existing population of Albanian Muslims. They participated in the series of Albanian uprisings before and during the spring Albanian Revolt of 1912. Some Albanian government troops switched sides. In a search for allies, Serbia was ready to negotiate a treaty with Bulgaria. The agreement provided that, in the event of victory against the Ottomans, Bulgaria would receive all of Macedonia south of the Kriva Palanka–Ohrid line. Serbia's expansion was accepted by Bulgaria as being to the north of the Shar Mountains (i.e. Kosovo). The intervening area was agreed to be "disputed"; it would be arbitrated by the Tsar of Russia in the event of a successful war against the Ottoman Empire. During the course of the war, it became apparent that the Albanians did not consider Serbia as a liberator, as suggested by King Peter I, nor did the Serbian forces observe his declaration of amity toward Albanians. After the successful coup d'état for unification with Eastern Rumelia, Bulgaria began to dream that its national unification would be realized. For that purpose, it developed a large army, and identified as the "Prussia of the Balkans." But Bulgaria could not win a war alone against the Ottomans. In Greece, Hellenic Army officers had rebelled in the Goudi coup of August 1909 and secured the appointment of a progressive government under Eleftherios Venizelos, which they hoped would resolve the Crete question in Greece's favour. They also wanted to reverse their defeat in the Greco-Turkish War of 1897 by the Ottomans. An emergency military reorganization led by a French military mission had been started for that purpose, but its work was interrupted by the outbreak of war in the Balkans. In the discussions that led Greece to join the Balkan League, Bulgaria refused to commit to any agreement on the distribution of territorial gains, unlike its deal with Serbia over Macedonia. Bulgaria's diplomatic policy was to push Serbia into an agreement limiting its access to Macedonia, while at the same time refusing any such agreement with Greece. Bulgaria believed that its army would be able to occupy the larger part of Aegean Macedonia and the important port city of Salonica (Thessaloniki) before the Greeks. In 1911, Italy had launched an invasion of Tripolitania in present-day Libya, which was quickly followed by the occupation of the Dodecanese Islands in the Aegean Sea. The Italians' decisive military victories over the Ottoman Empire encouraged the Balkan states to imagine they might win a war against the Ottomans. By the spring and summer of 1912, the various Christian Balkan nations had created a network of military alliances which became known as the Balkan League. The Great Powers, most notably France and Austria-Hungary, reacted to the formation of these alliances by trying to dissuade the League from going to war, but failed. In late September, both the League and the Ottoman Empire mobilized their armies. Montenegro was the first to declare war, on 25 September (O.S. )/8 October. After issuing an impossible ultimatum to the Porte on 13 October, Bulgaria, Serbia and Greece declared war on the Empire on 17 October. The declarations of war attracted a large number of war correspondents. An estimated 200–300 journalists from around the world covered the war in the Balkans in November 1912. The Ottoman order of battle when the war broke out constituted a total of 12,024 officers; 324,718 other ranks; 47,960 animals; 2,318 artillery pieces, and 388 machine guns. From these a total 920 officers and 42,607 men had been assigned in non-divisional units and services, the remaining 293,206 officers and men were assigned into four Armies. Opposing them and in continuation of their secret prewar settlements of expansion, the three Slavic allies (Bulgarian, Serbs and Montenegrins) had extensive plans to coordinate their war efforts: the Serbs and Montenegrins in the theater of Sandžak, the Bulgarians and Serbs in the Macedonian and Bulgaria alone in the Thracian theater. The bulk of the Bulgarian forces (346,182 men) was to attack Thrace, pitted against the Thracian Ottoman Army of 96,273 men and about 26,000 garrison troops or about 115,000 in total, according to Hall's, Erickson's and the Turkish Gen. Staff's 1993 studies. The remaining Ottoman army of about 200,000 was located in Macedonia, pitted against the Serbian (234,000 Serbs and 48,000 Bulgarians under Serb command) and Greek (115,000 men) armies. It was divided into the Vardar and Macedonian Ottoman armies, with independent static guards around the fortress cities of Ioannina (against the Greeks in Epirus) and Shkodër (against the Montenegrins in north Albania). Bulgaria was militarily the most powerful of the four Balkan states, with a large, well-trained and well-equipped army. Bulgaria mobilized a total of 599,878 men out of a population of 4.3 million. The Bulgarian field army counted for nine infantry divisions, one cavalry division and 1,116 artillery units. The Commander-in-Chief was Tsar Ferdinand, while operating command was in the hands of his deputy, General Mihail Savov. The Bulgarians also possessed a small navy of six torpedo boats, which were restricted to operations along the country's Black Sea coast. Bulgaria was focused on actions in Thrace and Macedonia. It deployed its main force in Thrace, forming three armies. The First Army (79,370 men), under general Vasil Kutinchev with three infantry divisions, was deployed to the south of Yambol, with direction of operations along the Tundzha river. The Second Army (122,748 men), under general Nikola Ivanov, with two infantry divisions and one infantry brigade, was deployed west of the First and was assigned to capture the strong fortress of Adrianople (Edirne). According to the plans, the Third Army (94,884 men), under general Radko Dimitriev, was deployed east of and behind the First, and was covered by the cavalry division hiding it from Turkish view. The Third Army had three infantry divisions and was assigned to cross the Stranja mountain and to take the fortress of Kirk Kilisse (Kırklareli). The 2nd (49,180) and 7th (48,523 men) divisions were assigned independent roles, operating in Western Thrace and Eastern Macedonia respectively. 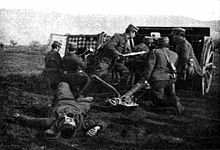 Serbia called upon about 255,000 men (out of a population of 2,912,000 people) with about 228 heavy guns, grouped in 10 infantry divisions, two independent brigades and a cavalry division, under the effective command of the former War Minister Radomir Putnik. The Serbian High Command, in its pre-war wargames,[clarification needed] had concluded that the likeliest site of the decisive battle against the Ottoman Vardar Army would be on the Ovče Pole plateau, before Skopje. Hence, the main forces were formed in three armies for the advance towards Skopje, while a division and an independent brigade were to cooperate with the Montenegrins in the Sanjak of Novi Pazar. The First Army (132,000 men) was the strongest and was commanded by General Petar Bojović, forming the center of the drive towards Skopje. The Second Army (74,000 men) was commanded by General Stepa Stepanović, and consisted of one Serbian and one Bulgarian (7th Rila) division. It formed the left wing of the Army and advanced towards Stracin. The inclusion of a Bulgarian division was according to a pre-war arrangement between Serbian and Bulgarian armies, but that division ceased to obey the orders of Gen. Stepanović as soon as the war began, following only the orders of the Bulgarian High Command. The Third Army (76,000 men) was commanded by General Božidar Janković and, being the army on the right wing, had the task to take Kosovo. It would then join the other armies in the expected battle at Ovče Polje. There were two other concentrations in northwestern Serbia across the Serbo-Austrohungarian borders, the Ibar Army (25,000 men) under General Mihailo Živković and the Javor brigade (12,000 men) under Lt Colonel Milovoje Anđelković. Greece, at the time a state of 2,666,000 people, was considered the weakest of the three main allies, since it fielded the smallest army and had suffered a defeat against the Ottomans 16 years before in the Greco-Turkish War of 1897. A British consular dispatch from 1910 expresses the common perception of the Greek Army's capabilities at the time: "if there is war we shall probably see that the only thing Greek officers can do besides talking is to run away". However, Greece was the only Balkan country to possess a substantial navy. This was vital to the League, as it could prevent Ottoman reinforcements from being rapidly transferred by ship from Asia to Europe. This fact was readily appreciated by the Serbs and Bulgarians, and was the chief factor in initiating the process of Greece's inclusion in their alliance. As the Greek ambassador to Sofia put it during the negotiations that led to Greece's entry into the League: "Greece can provide 600,000 men for the war effort. 200,000 men in the field, and the fleet will be able to stop 400,000 men being landed by Turkey between Salonica and Gallipoli." The Greek Army was still undergoing reorganization by a French military mission, called in 1911, one year before the war. Under French supervision, the Greeks had adopted the triangular infantry division as their main formation, but more importantly, the overhaul of the mobilization system allowed the country to field and equip a far greater number of troops than it had in 1897. While foreign observers estimated Greece would mobilize a force of approximately 50,000 men, the Greek Army fielded 125,000, with another 140,000 in the National Guard and reserves. Upon mobilization, as in 1897, this force was grouped in two field armies, reflecting the geographic division between the two operational theaters open to the Greeks: Thessaly and Epirus. The Army of Thessaly (Στρατιά Θεσσαλίας) was placed under Crown Prince Constantine, with Lt Gen Panagiotis Danglis as his chief of staff. It fielded the bulk of the Greek forces: seven infantry divisions, a cavalry regiment and four independent Evzones light mountain infantry battalions, roughly 100,000 men. It was expected to overcome the fortified Ottoman border positions and advance towards south and central Macedonia, aiming to take Thessaloniki and Bitola. The remaining 10,000 to 13,000 men in eight battalions were assigned to the Army of Epirus (Στρατιά Ηπείρου) under Lt Gen Konstantinos Sapountzakis. As it had no hope of capturing Ioannina, the heavily fortified capital of Epirus, its initial mission was to pin down the Ottoman forces there, until sufficient reinforcements could be sent from the Army of Thessaly after its successful conclusion of operations. The armored cruiser Georgios Averof, flagship of the Greek fleet. At the time, she was the most modern warship involved in the conflict, and played a crucial role in operations in the Aegean Sea. The Greek Navy was relatively modern, strengthened by the recent purchase of numerous new units and undergoing reforms under the supervision of a British mission. Invited by Prime Minister Venizelos in 1910, the mission began its work upon its arrival in May 1911. Granted extraordinary powers and led by Vice Admiral Lionel Grand Tufnell, it thoroughly reorganized the Navy Ministry and dramatically improved the number and quality of exercises in gunnery and fleet maneuvers. In 1912, the core unit of the fleet was the fast armoured cruiser Georgios Averof, completed in 1910 and, at that time, the fastest and most modern warship in the combatant navies. It was complemented by three rather antiquated battleships of the Hydra class. There were also eight destroyers built in 1906–1907, and six new destroyers that were hastily bought in summer 1912 as the imminence of war became apparent. Nevertheless, at the outbreak of the war, the Greek fleet was far from ready. The Ottoman battlefleet retained a clear advantage in number of ships, speed of the main surface units and, more importantly, in the number and caliber of the ships' guns. In addition, as the war caught the fleet in the middle of its expansion and reorganization, fully a third of the fleet (the six new destroyers and the submarine Delfin) only reached Greece after hostilities had started, forcing the navy to reshuffle crews, who consequently suffered from lacking familiarization and training time. Coal stockpiles and other war stores were also in short supply, while the Georgios Averof had arrived with barely any ammunition, and would remain so until late November. Montenegro was also considered as the smallest nation in the Balkan Peninsula, but in recent years before the war, with support from Russia, it had improved its military skills. Also, it was the only Balkan country never to be fully conquered by the Ottoman Empire. Due to Montenegro being the smallest member of the League, it didn't have much influence. Despite this, it was advantageous for Montenegro,[clarification needed] because when the Ottoman Empire was trying to counter the actions of Serbia, Bulgaria and Greece, Montenegro had enough time for preparations which helped its successful military campaign. In 1912, the Ottomans were in a difficult position. They had a large population, 26 million, but just over 6.1 million of them lived in the European part of the Empire. Of these, only 2.3 million were Muslims, the rest being Christians, who were considered unfit for conscription. The very poor transport network, especially in the Asian part, dictated that the only reliable way for a mass transfer of troops to the European theater was by sea, but that was at risk due to the Greek fleet in the Aegean Sea. In addition, the Ottomans were still engaged in a protracted war against the Italians in Libya (and by now in the Dodecanese islands of the Aegean), which had dominated the Ottoman military effort for over a year. The conflict lasted until 15 October, a few days after the outbreak of hostilities in the Balkans. The Ottomans were unable to significantly reinforce their positions in the Balkans as their relations with the Balkan states deteriorated over the course of the year. The Ottomans' military capabilities were hampered by a number of factors, beginning with domestic strife, caused by the Young Turk Revolution and the counter-revolutionary coup several months later (see Ottoman countercoup of 1909 and 31 March Incident). This resulted in different groups competing for influence within the military. A German mission had tried to reorganize the army, but its recommendations had not been fully implemented. The Ottoman army was caught in the midst of reform and reorganization. In addition, several of the army's best battalions had been transferred to Yemen to face the ongoing rebellion there. In the summer of 1912, the Ottoman High Command made the disastrous decision to dismiss some 70,000 mobilized troops. The regular army (Nizam) was composed of well-equipped and trained active divisions, but the reserve units (Redif) that reinforced it were ill-equipped, especially in artillery, and badly trained. The Ottomans' strategic situation was difficult, as their borders were almost impossible to defend against a co-ordinated attack by the Balkan states. The Ottoman leadership decided to defend the entirety of their territory. As a result, the available forces—which could not be easily reinforced from Asia due to Greek control of the sea and the inadequacy of the Ottoman railway system—were dispersed too thinly across the region. They failed to stand up to the rapidly mobilized Balkan armies. The Ottomans had three armies in Europe (the Macedonian, Vardar and Thracian Armies), with 1,203 pieces of mobile and 1,115 fixed artillery on fortified areas. The Ottoman High Command repeated its error of previous wars by ignoring the established command structure and by creating new superior commands, the Eastern Army and Western Army, reflecting the division of the operational theater between the Thracian (against the Bulgarians) and Macedonian (against Greeks, Serbs and Montenegrins) fronts. I Corps with three divisions (2nd Infantry (minus regiment), 3rd Infantry and 1st Provisional divisions). II Corps with three divisions (4th (minus regiment) and 5th Infantry and Uşak Redif divisions). III Corps with four divisions (7th, 8th and 9th Infantry Divisions, all minus a regiment, and the Afyonkarahisar Redif Division). IV Corps with three divisions (12th Infantry Division (minus regiment), İzmit and Bursa Redif divisions). XVII Corps with three divisions (Samsun, Ereğli and İzmir Redif divisions). Edirne Fortified Area with six-plus divisions (10th and 11th Infantry, Edirne, Babaeski and Gümülcine Redif and the Fortress division, 4th Rifle and 12th Cavalry regiments). Kırcaali Detachment with two-plus divisions (Kırcaali Redif, Kırcaali Mustahfız division and 36th Infantry Regiment). An independent Cavalry Division and the 7th and 8th Cavalry Brigades. The Macedonian Army (HQ in Thessaloniki under Ali Rıza Pasha) was composed of 14 divisions in five corps detailed against Greece, Bulgaria and Montenegro. VIII Provisional Corps with three divisions (22nd Infantry and Nasliç and Aydın Redif divisions). Yanya Corps with three divisions (23rd Infantry, Yanya Redif and Bizani Fortress divisions). Selanik Redif division and Karaburun Detachment as independent units. Against Bulgaria in south-eastern Macedonia, two divisions forming the Struma Corps (14th Infantry and Serez Redif divisions, plus the Nevrekop Detachment) were deployed. According to the organizational plan, the men of the Western Group were to total 598,000, but slow mobilization and the inefficiency of the rail system drastically reduced the number of men available. According to the Western Army Staff, when war began, they had only 200,000 men available. Although during the next period more men reached the units, due to war casualties, the Western Group never came near its nominal strength. In time of war, the Ottomans had planned to bring more troops in from Syria, both Nizamiye and Redif. Greek naval supremacy prevented those reinforcements from arriving. Instead those soldiers had to deploy via the land route, and most never made it to the Balkans. The Ottoman General Staff, assisted by the German Military Mission, developed 12 war plans, designed to counter various combinations of opponents. Work on plan No. 5, which was against a combination of Bulgaria, Greece, Serbia and Montenegro, was very advanced, and had been sent to the Army staffs for them to develop local plans. Barbaros Hayreddin, the Ottoman flagship (pictured here) and her sister Turgut Reis were more heavily protected and had more and heavier primary armament than Georgios Averof, but were five knots slower. The Ottoman fleet had performed abysmally in the Greco-Turkish War of 1897, forcing the Ottoman government to begin a drastic overhaul. Older ships were retired and newer ones acquired, chiefly from France and Germany. In addition, in 1908 the Ottomans called in a British naval mission to update their training and doctrine. In the event, the British mission, headed by Admiral Sir Douglas Gamble, would find its task almost impossible. To a large extent this was due to the political upheaval in the aftermath of the Young Turk Revolution; between 1908 and 1911, the office of Navy Minister changed hands nine times. Inter-departmental infighting and the entrenched interests of the bloated and over-aged officer corps, many of whom occupied their positions as a quasi-sinecure, further obstructed drastic reform. In addition, British attempts to control the Navy's construction programme were met with suspicion by the Ottoman ministers, and funds for Gamble's ambitious plans for new ships were not available. To counter the Greek acquisition of the Georgios Averof, the Ottomans initially tried to buy the new German armoured cruiser SMS Blücher or the battlecruiser SMS Moltke. Not able to afford the ships' high cost, the Ottomans acquired two old Brandenburg-class pre-dreadnought battleships, which became Barbaros Hayreddin and Turgut Reis. Along with the cruisers Hamidiye and Mecidiye, these two ships were to form the relatively modern core of the Ottoman battlefleet. By the summer of 1912, however, they were already in poor condition due to chronic neglect: the rangefinders and ammunition hoists had been removed, the telephones were not working, the pumps were corroded, and most of the watertight doors could no longer be closed. Montenegro started the First Balkan War by declaring war against the Ottomans on 8 October [O.S. 25 September] 1912. The western region of the Balkans, including Albania, Kosovo, and Macedonia was less important to the resolution of the war and the survival of the Ottoman Empire than the Thracian theater, where the Bulgarians fought major battles against the Ottoman forces. Although the geography dictated that Thrace would be the major battlefield in a war with the Ottoman Empire, the position of the Ottoman Army there was jeopardized by erroneous intelligence estimates of their opponents' order of battle. Unaware of the secret prewar political and military settlement over Macedonia between Bulgaria and Serbia, the Ottoman leadership assigned the bulk of their forces there. The German ambassador Hans Baron von Wangenheim, one of the most influential people in the Ottoman capital, had reported to Berlin on 21 October that the Ottoman forces believed that the bulk of the Bulgarian army would be deployed in Macedonia with the Serbs. Subsequently, the Ottoman HQ under Abdullah Pasha expected to meet only three Bulgarian infantry divisions, accompanied by cavalry, east of Adrianople. According to E. J. Erickson this assumption possibly resulted from their analysis of the objectives of the Balkan Pact – but it had deadly consequences for the Ottoman Army in Thrace, which would have to defend the area against the bulk of the Bulgarian army against impossible odds. This misappraisal was also the reason of the catastrophic aggressive Ottoman strategy at the start of the campaign in Thrace. In the Thracian front the Bulgarian army had placed 346,182 men against the Ottoman 1st Army with 105,000 men in eastern Thrace and the Kircaali detachment of 24,000 men in western Thrace. The Bulgarian forces were divided into the 1st (Lt. Gen. Vasil Kutinchev), 2nd (Lt. Gen. Nikola Ivanov) and 3rd (Lt. Gen. Radko Dimitriev) Bulgarian Armies of 297,002 men in the eastern part and 49,180 (33,180 regulars and 16,000 irregulars) under the 2nd Bulgarian Division (Gen. Stilian Kovachev) in the western part. The first large-scale battle occurred against the Edirne-Kırklareli defensive line, where the Bulgarian 1st and 3rd Armies (together 174,254 men) defeated the Ottoman East Army (of 96,273 combatants), near Gechkenli, Seliolu and Petra. The Ottoman XV Corps urgently left the area to defend the Gallipoli peninsula against an expected Greek amphibious assault, which in the event never materialized. The absence of this Corps created an immediate vacuum between Adrianople and Demotika, and the 11th Infantry Division from the Eastern Army's IV Corps was moved there to replace it. Thus one complete army corps was removed from the Eastern Army's order of battle. As a consequence of the insufficient intelligence on the invading forces, the Ottoman offensive plan failed completely in the face of Bulgarian superiority, forcing Kölemen Abdullah Pasha to abandon Kirk Kilisse, which was taken without resistance by the Bulgarian Third Army. The fortress of Adrianople, with some 61,250 men, was isolated and besieged by the Bulgarian Second Army, although for the time being no assault was possible due to the lack of siege equipment in the Bulgarian inventory. Another consequence of the Greek naval supremacy in the Aegean was that the Ottoman forces did not receive the reinforcements projected in the war plans, consisting of a further corps to be transferred by sea from Syria and Palestine. Thus the Greek Navy played a crucial albeit indirect role in the Thracian campaign by neutralizing three corps, a significant portion of the Ottoman Army, in the all-important opening round of the war. Another, more direct, role was the emergency transportation of the Bulgarian 7th Rila Division from the Macedonian to the Thracian front after the termination of operations there. The Bulgarian attack at Çatalca. After the battle of Kirk Kilisse the Bulgarian high command decided to wait a few days, a decision which allowed the Ottoman forces to occupy a new defensive position on the Lüleburgaz-Karaağaç-Pınarhisar line. Despite this, the Bulgarian attack by the First and Third Army which together accounted for 107,386 rifleman, 3,115 cavalry, 116 machine guns and 360 artillery pieces defeated the reinforced Ottoman Army consisting of 126,000 riflemen, 3,500 cavalry, 96 machine guns and 342 artillery pieces and reached the Sea of Marmara. In terms of forces engaged it was the largest battle fought in Europe between the end of the Franco-Prussian War and the beginning of the First World War. As a result of it the Ottoman forces were pushed to their final defensive position across the Çatalca Line protecting the peninsula on which Constantinople is located. There they succeeded in stabilizing the front with the help of fresh reinforcements from the Asian provinces. The line had been constructed during the Russo-Turkish War of 1877-8 under the directions of a German engineer in Ottoman service, von Bluhm Pasha, but was considered obsolete by 1912. An epidemic of cholera spread among the Bulgarian soldiers after the Battle of Luleburgas - Bunarhisar. Andranik Ozanian (left) and Garegin Nzhdeh (right) both led a company of Armenian volunteers within the Macedonian-Adrianopolitan Volunteer Corps. Meanwhile, the forces of the Bulgarian 2nd Thracian division, 49,180 men divided into the Haskovo and Rhodope detachments, advanced toward the Aegean Sea. The Ottoman Kircaali detachment (Kircaali Redif and Kircaali Mustahfiz Divisions and 36th Regiment with 24,000 men), tasked with defending a 400 km front across the Thessaloniki-Alexandroupoli railroad, failed to offer serious resistance and on 26 November their commander Yaver Pasha was captured together with 10,131 officers and men by Macedonian-Adrianopolitan Volunteer Corps. After the occupation of Thessaloniki by the Greek army, his surrender completed the isolation of the Ottoman forces in Macedonia from those in Thrace. The delegates at the Çatalca armistice; General Ivan Fichev, Nazim Pasha and General Mihail Savov are seen in the first row. On 17 November [O.S. 4 November] 1912, the offensive against the Çatalca Line began, despite clear warnings from Russia that if the Bulgarians occupied Constantinople it would attack them. The Bulgarians launched their attack along the defensive line with 176,351 men and 462 artillery pieces against the Ottomans' 140,571 men and 316 artillery pieces, but despite Bulgarian superiority, the Ottomans succeeded in repulsing them. An armistice was consequently agreed on 3 December [O.S. 20 November] 1912 between the Ottomans and Bulgaria, the latter also representing Serbia and Montenegro, and peace negotiations began in London. Greece also participated in the conference, but refused to agree to a truce, continuing its operations in the Epirus sector. The negotiations were interrupted on 23 January [O.S. 10 January] 1913, when a Young Turk coup d'état in Constantinople under Enver Pasha overthrew the government of Kâmil Pasha. Upon expiration of the armistice, on 3 February [O.S. 21 January] 1913, hostilities recommenced. On 20 February Ottoman forces began their attack, both in Çatalca and south, at Gallipoli. There the Ottoman X Corps, with 19,858 men and 48 guns, landed at Şarköy, at the same time as an attack of around 15,000 men supported by 36 guns (part of the 30,000-strong Ottoman army isolated in the Gallipoli peninsula) at Bulair further south. Both attacks were supported by fire from Ottoman warships, and were intended in the long term to relieve pressure on Edirne. Confronting them were about 10,000 men with 78 guns. The Ottomans were probably unaware of the presence in the area of the newly formed 4th Bulgarian Army of 92,289 men under General Stiliyan Kovachev. The Ottoman attack in the thin isthmus, with a front of just 1,800m, was hampered by thick fog and strong Bulgarian artillery and machine gunfire. As a result, the attack stalled, and was repulsed by a Bulgarian counterattack. By the end of the day both armies had returned to their original positions. Meanwhile, the Ottoman X Corps, which had landed at Şarköy, advanced until by 23 February [O.S. 10 February] 1913 the reinforcements sent by General Kovachev succeeded in halting them. Casualties on both sides were light. After the failure of the frontal attack in Bulair, the Ottoman forces at Şarköy re-embarked into their ships on 11 February and were transported to Gallipoli. The Ottoman attack at Çatalca, directed against the powerful Bulgarian First and Third Armies, was initially launched only as a diversion from the Gallipoli-Şarköy operation, pinning down the Bulgarian forces in situ. Nevertheless, it resulted in unexpected success. The Bulgarians, who were weakened by cholera and concerned that an Ottoman amphibious invasion might endanger their armies, deliberately withdrew about 15 km and to the south over 20 km to their secondary defensive positions on higher ground to the west. With the end of the attack in Gallipoli the Ottomans canceled the operation, reluctant to leave the Çatalca Line, but several days passed before the Bulgarians realized that the offensive was over. By 15 February the front had again stabilized but the fighting along the static lines continued until the armistice. The battle, which resulted in heavy Bulgarian casualties, could be characterized as an Ottoman victory at the tactical level, but strategically it was a failure, since it did nothing to prevent the failure of the Gallipoli-Şarköy operation or relieve the pressure on Edirne. Bulgarian soldiers in the Ayvaz Baba fort, outside Adrianople, after its capture. The failure of the Şarköy-Bulair operation and the deployment of the 2nd Serbian Army together with its much needed heavy siege artillery sealed Adrianople's fate. On 11 March after a two weeks' bombardment which destroyed many of the fortified structures around the city, the final assault started with Allied forces enjoying a crushing superiority over the Ottoman garrison. Under the command of General Nikola Ivanov, the Bulgarian 2nd Army with 106,425 men and two Serb divisions with 47,275 men conquered the city, with the Bulgarians suffering 8,093 and the Serbs 1,462 casualties. The Ottoman casualties for the entire Adrianople campaign reached 23,000 killed. The number of prisoners is less clear. The Ottoman Empire began the war with 61,250 men in the Adrianople fortress. Richard Hall notes that 60,000 men were captured. Adding to the 33,000 killed, the modern Turkish General Staff History notes that 28,500 man survived captivity leaving only 10,000 men unaccounted for as possibly captured (including the unspecified number of wounded). Bulgarian losses for the entire Adrianople campaign amounted to 7,682. This was the last and decisive battle that was necessary for a quick end to the war, even though it is speculated that the fortress would have fallen eventually due to starvation. The most important result was that now the Ottoman command lost all hopes of regaining the initiative, which made any further fighting pointless. The battle had major and key results in Serbo-Bulgarian relations, planting the seeds of the two countries' confrontation some months later. The Bulgarian censor rigorously cut any references about the Serbian participation in the operation in the telegrams of the foreign correspondents. Public opinion in Sofia thus failed to realise the crucial services Serbia rendered in the battle. Accordingly, the Serbs claimed that their troops of the 20th Regiment were those who captured the Ottoman commander of the city, and that Colonel Gavrilović was the allied officer who accepted Shukri's official surrender of the garrison, a statement that the Bulgarians disputed. Subsequently, the Serbs officially protested, pointing out that although they had sent their troops to Adrianople to win for Bulgaria territory whose acquisition had never been foreseen by their mutual treaty, the Bulgarians had never fulfilled the clause of the treaty requiring Bulgaria to send 100,000 men to help the Serbians on their Vardar front. The Bulgarians answered that their staff had informed the Serbs about that on 23 August. [clarification needed] The friction escalated some weeks later when the Bulgarian delegates in London bluntly warned the Serbs that they must not expect Bulgarian support on their Adriatic claims. The Serbs angrily replied that was a clear withdrawal from the prewar agreement of mutual understanding according to the Kriva Palanka-Adriatic line of expansion, but the Bulgarians insisted that in their view, the Vardar Macedonian part of the agreement remained active and the Serbs were still obliged to surrender the area as agreed. The Serbs answered by accusing the Bulgarians of maximalism, pointing out that if they lost both northern Albania and Vardar Macedonia, their participation in the common war would have been virtually for nothing. The tension soon was expressed in a series of hostile incidents between the two armies along their common line of occupation across the Vardar valley. The developments essentially ended the Serbo-Bulgarian alliance and made a future war between the two countries inevitable. Ottoman intelligence had also disastrously misread Greek military intentions. In retrospect, it would appear that the Ottoman staffs believed that the Greek attack would be shared equally between the two major avenues of approach, Macedonia and Epirus. The 2nd Army staff had therefore evenly balanced the combat strength of the seven Ottoman divisions between the Yanya Corps and VIII Corps, in Epirus and southern Macedonia respectively. The Greek Army also fielded seven divisions, but, having the initiative, concentrated all seven against VIII Corps, leaving only a number of independent battalions of scarcely divisional strength in the Epirus front. This had fatal consequences for the Western Group of Armies, since it led to the early loss of the strategic center of all three Macedonian fronts, the city of Thessaloniki, a fact that sealed their fate. In an unexpectedly brilliant and rapid campaign, the Army of Thessaly seized the city. In the absence of secure sea lines of communications, the retention of the Thessaloniki-Constantinople corridor was essential to the overall strategic posture of the Ottoman Empire in the Balkans. Once this was gone, the defeat of the Ottoman Army became inevitable. To be sure, the Bulgarians and the Serbs played an important role in the defeat of the main Ottoman armies. Their great victories at Kirkkilise, Lüleburgaz, Kumanovo, and Monastir (Bitola) shattered the Eastern and Vardar Armies. However, these victories were not decisive in the sense that they ended the war. The Ottoman field armies survived, and in Thrace, they actually grew stronger day by day. In the strategic point of view these victories were enabled partially by the weakened condition of the Ottoman armies brought about by the active presence of the Greek army and fleet. With the declaration of war, the Greek Army of Thessaly under Crown Prince Constantine advanced to the north, successfully overcoming Ottoman opposition in the fortified mountain passes of Sarantaporo. After another victory at Giannitsa (Yenidje) on 2 November [O.S. 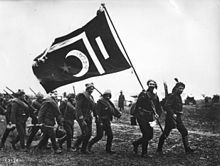 20 October] 1912, the Ottoman commander Hasan Tahsin Pasha surrendered Thessaloniki and its garrison of 26,000 men to the Greeks on 9 November [O.S. 27 October] 1912. Two Corps HQs (Ustruma and VIII), two Nizamiye divisions (14th and 22nd) and four Redif divisions (Salonika, Drama, Naslic and Serez) were thus lost to the Ottoman order of battle. Additionally, the Ottoman forces lost 70 artillery pieces, 30 machine guns and 70,000 rifles (Thessaloniki was the central arms depot for the Western Armies). The Ottoman forces estimated that 15,000 officers and men had been killed during the campaign in south Macedonia, bringing total losses up to 41,000 soldiers. Another direct consequence was that the destruction of the Macedonian Army sealed the fate of the Ottoman Vardar Army, which was fighting the Serbs to the north. The fall of Thessaloniki left it strategically isolated, without logistical supply and depth to maneuver, ensuring its destruction. Upon learning of the outcome of the battle of Giannitsa (Yenidje), the Bulgarian high command urgently dispatched their 7th Rila Division from the north in the direction of the city. The division arrived there a week later, the day after its surrender to the Greeks. Until 10 November, the Greek-occupied zone had been expanded to the line from Lake Dojran to the Pangaion hills west to Kavalla. In western Macedonia however, the lack of coordination between the Greek and Serbian HQs cost the Greeks a setback in the Battle of Vevi on 15 November [O.S. 2 November] 1912, when the Greek 5th Infantry Division crossed its way with the VI Ottoman Corps (a part of the Vardar Army consisting of the 16th, 17th and 18th Nizamiye divisions), retreating to Albania following the battle of Prilep against the Serbs. The Greek division, surprised by the presence of the Ottoman Corps, isolated from the rest of Greek army and outnumbered by the now counterattacking Ottomans centered on Monastir (Bitola), was forced to retreat. As a result, the Serbs beat the Greeks to Bitola. In the Epirus front the Greek army was initially heavily outnumbered, but due to the passive attitude of the Ottomans succeeded in conquering Preveza on 21 October 1912 and pushing north to the direction of Ioannina. 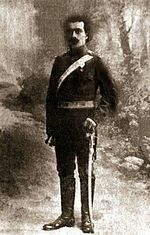 On 5 November, Major Spyros Spyromilios led a revolt in the coastal area of Himarë and expelled the Ottoman garrison without facing significant resistance, while on 20 November Greek troops from western Macedonia entered Korçë. However, Greek forces in the Epirote front had not the numbers to initiate an offensive against the German-designed defensive positions of Bizani that protected the city of Ioannina, and therefore had to wait for reinforcements from the Macedonian front. After the campaign in Macedonia was over, a large part of the Army was redeployed to Epirus, where Crown Prince Constantine himself assumed command. In the Battle of Bizani the Ottoman positions were breached and Ioannina taken on 6 March [O.S. 22 February] 1913. During the siege, on 8 February 1913, the Russian pilot N. de Sackoff, flying for the Greeks, became the first pilot ever shot down in combat, when his biplane was hit by ground fire following a bomb run on the walls of Fort Bizani. He came down near the small town of Preveza, on the coast north of the Ionian island of Lefkas, secured local Greek assistance, repaired his plane and resumed flight back to base. The fall of Ioannina allowed the Greek army to continue its advance into northern Epirus, the southern part of modern Albania, which it occupied. There its advance stopped, although the Serbian line of control was very close to the north. On the outbreak of hostilities on 18 October, the Greek fleet, placed under the newly promoted Rear Admiral Pavlos Kountouriotis, sailed for the island of Lemnos, occupying it three days later (although fighting continued on the island until 27 October) and establishing an anchorage at Moudros Bay. This move was of major strategic importance, as it provided the Greeks with a forward base in close distance to the Dardanelles Straits, the Ottoman fleet's main anchorage and refuge. In view of the Ottoman fleet's superiority in speed and broadside weight, the Greek planners expected it to sortie from the straits early in the war. Given the Greek fleet's unpreparedness resulting from the premature outbreak of the war, such an early Ottoman attack might well have been able to achieve a crucial victory. Instead, the Ottoman Navy spent the first two months of the war in operations against the Bulgarians in the Black Sea, giving the Greeks valuable time to complete their preparations and allowing them to consolidate their control of the Aegean. By mid-November Greek naval detachments had seized the islands of Imbros, Thasos, Agios Efstratios, Samothrace, Psara and Ikaria, while landings were undertaken on the larger islands of Lesbos and Chios only on 21 and 27 November respectively. Substantial Ottoman garrisons were present on the latter, and their resistance was fierce. They withdrew into the mountainous interior and were not subdued until 22 December and 3 January respectively. Samos, officially an autonomous principality, was not attacked until 13 March 1913, out of a desire not to upset the Italians in the nearby Dodecanese. The clashes there were short-lived as the Ottoman forces withdrew to the Anatolian mainland, so that the island was securely in Greek hands by 16 March. Lieutenant Nikolaos Votsis scored a major success for Greek morale on 31 October: he sailed his torpedo boat No. 11, under the cover of night, into the harbor of Thessaloniki, sank the old Ottoman ironclad battleship Feth-i Bülend and escaped unharmed. On the same day, Greek troops of the Epirus Army seized the Ottoman naval base of Preveza. The Ottomans scuttled the four ships present there, but the Greeks were able to salvage the Italian-built torpedo-boats Antalya and Tokat, which were commissioned into the Greek Navy as Nikopolis and Tatoi respectively. A few days later, on 9 November, the wooden Ottoman armed steamer Trabzon was intercepted and sunk by the Greek torpedo boat No. 14 under Lt. Periklis Argyropoulos off Ayvalık. A depiction of the sinking of the Feth-i Bülend in a popular lithograph. Votsis is shown in the lower left corner. The main Ottoman fleet remained inside the Dardanelles for the early part of the war, while the Greek destroyers continuously patrolled the straits' exit to report on a possible sortie. Kountouriotis suggested mining the straits, but was not taken up for fear of international reactions. On 7 December, the head of the Ottoman fleet Tahir Bey was replaced by Ramiz Naman Bey, the leader of the hawkish faction among the officer corps. A new strategy was agreed, whereby the Ottomans were to take advantage of any absence of Georgios Averof to attack the other Greek ships. The Ottoman staff formulated a plan to lure a number of the Greek destroyers on patrol into a trap. A first such effort on 12 December failed due to boiler trouble, but the second try two days later resulted in an indecisive engagement between the Greek destroyers and the cruiser Mecidiye. The war's first major fleet action, the Battle of Elli, was fought two days later, on 16 December [O.S. 3 December] 1912. The Ottoman fleet, with four battleships, nine destroyers and six torpedo boats, sailed to the entrance of the straits. The lighter Ottoman vessels remained behind, but the battleship squadron moved on north under cover of the forts at Kumkale and engaged the Greek fleet, coming from Imbros, at 9:40. Leaving the older battleships to follow their original course, Kountouriotis led the Averof into independent action: utilizing her superior speed, she cut across the Ottoman fleet's bow. Under fire from two sides, the Ottomans were quickly forced to withdraw to the Dardanelles. The whole engagement lasted less than an hour, in which the Ottomans suffered heavy damage to the Barbaros Hayreddin and 18 dead and 41 wounded (most during their disorderly retreat), and the Greeks one dead and seven wounded. In the aftermath of Elli, on 20 December the energetic Lt. Commander Rauf Bey was placed in effective command of the Ottoman fleet. Two days later he led his forces out, hoping again to trap the patrolling Greek destroyers between two divisions of the Ottoman fleet, one heading for Imbros and the other waiting at the entrance of the straits. The plan failed as the Greek ships quickly broke contact. At the same time the Mecidiye came under attack by the Greek submarine Delfin, which launched a torpedo against it but missed; the first such attack in history. During this period, the Ottoman Army continued to press upon a reluctant Navy a plan for the re-occupation of Tenedos, which the Greek destroyers used as a base, by an amphibious operation. The operation was scheduled for 4 January. On that day, weather conditions were ideal and the fleet was ready, but the Yenihan regiment earmarked for the operation failed to arrive on time. The naval staff nevertheless ordered the fleet to sortie, and an engagement developed with the Greek fleet, without any significant results on either side. Similar sorties followed on 10 and 11 January, but the results of these "cat and mouse" operations were always the same: "the Greek destroyers always managed to remain outside the Ottoman warships' range, and each time the cruisers fired a few rounds before breaking off the chase." Ottoman cruiser Hamidiye. Its exploits during its eight-month cruise through the Mediterranean were a major morale booster for the Ottomans. In preparation for the next attempt to break the Greek blockade, the Ottoman Admiralty decided to create a diversion by sending the light cruiser Hamidiye, captained by Rauf Bey, to raid Greek merchant shipping in the Aegean. It was hoped that the Georgios Averof, the only major Greek unit fast enough to catch the Hamidiye, would be drawn in pursuit and leave the remainder of the Greek fleet weakened. In the event, Hamidiye slipped through the Greek patrols on the night of 14–15 January and bombarded the harbor of the Greek island of Syros, sinking the Greek auxiliary cruiser Makedonia which lay in anchor there (it was later raised and repaired). The Hamidiye then left the Aegean for the Eastern Mediterranean, making stops at Beirut and Port Said before entering the Red Sea. Although providing a major morale boost for the Ottomans, the operation failed to achieve its primary objective, as Kountouriotis refused to leave his post and pursue the Hamidiye. Four days later, on 18 January [O.S. 5 January] 1913, when the Ottoman fleet again sallied from the straits towards Lemnos, it was defeated for a second time in the Battle of Lemnos. This time, the Ottoman warships concentrated their fire on the Averof, which again made use of its superior speed and tried to "cross the T" of the Ottoman fleet. Barbaros Hayreddin was again heavily damaged, and the Ottoman fleet was forced to return to the shelter of the Dardanelles and their forts. The Ottomans suffered 41 killed and 101 wounded. It was the last attempt of the Ottoman Navy to leave the Dardanelles, thereby leaving the Greeks dominant in the Aegean. On 5 February [O.S. 24 January] 1913, a Greek Farman MF.7, piloted by Lt. Moutousis and with Ensign Moraitinis as an observer, carried out an aerial reconnaissance of the Ottoman fleet in its anchorage at Nagara, and launched four bombs on the anchored ships. Although it scored no hits, this operation is regarded as the first naval-air operation in military history. The Serbian forces operated against the major part of Ottoman Western army which were located in the areas of Novi Pazar, Kosovo and northern and eastern Macedonia. Strategically the Serbian forces were divided into four independent armies and groups: the Javor brigade and the Ibar Army, which operated against Ottoman forces in the area of Novi Pazar; the Third Army, which operated against Ottoman forces in the areas of Kosovo and Metohija; the First Army, which operated against Ottoman forces in the area of northern Macedonia; and the Second Army (operating from the Bulgarian territory), which operated against Ottoman forces in the area of eastern Macedonia. The decisive battle was expected to be fought in the area of northern Macedonia, more specifically in the plains of Ovče Pole, where the main forces of Ottoman Vardar Army were expected to concentrate. According to the plan of the Serbian Supreme Command, three Serbian armies (First, Second and Third) were supposed to encircle and destroy the Vardar Army in that area, with the First Army advancing from the north (along the line of Vranje-Kumanovo-Ovče Pole ), the Second Army advancing from the east (along the line of Kriva Palanka-Kratovo-Ovče Pole) and the Third Army advancing from the north-west (along the line of Priština-Skopje-Ovče Pole). In the execution of this plan the main role was given to the First Army while the Second Army was expected to cut off the Vardar Army's retreat route, and if necessary attack its rear and right flank. The main goal of Third Army was to take Kosovo and Metohija, and if necessary give assistance to the First Army by attacking the Vardar Army's left flank and rear. The Ibar Army and the Javor brigade had a minor role in the Serbian plan: they were expected to secure the Sanjak of Novi Pazar and replace Third Army in Kosovo after advancing farther south. The Serbian Army under General (later Marshal) Putnik achieved three decisive victories in Vardar Macedonia, its primary objective in the war, effectively destroying the Ottoman forces in the region and conquering northern Macedonia. They also helped the Montenegrins to take the Sandžak and sent two divisions to help the Bulgarians at the siege of Edirne. The last battle for Macedonia was the battle of Monastir, in which the remains of the Ottoman Vardar Army were forced to retreat to central Albania. After the battle, Prime Minister Pasic asked Gen. Putnik to take part in the race for Thessaloniki. Putnik declined and instead turned his army to the west, towards Albania, foreseeing that a future confrontation between the Greeks and Bulgarians over Thessaloniki could greatly help Serbia's own plans for Vardar Macedonia. After the Great Powers applied pressure on them, the Serbs started to withdraw from northern Albania and the Sandžak, although they left behind their heavy artillery park to help the Montenegrins in the continuing siege of Shkodër. On 23 April 1913, Shkodër's garrison was forced to surrender due to starvation. The principal reason for the Ottoman defeat in the fall of 1912 was the decision on the part of the Ottoman government to respond to the ultimatum from the Balkan League on 15 October 1912 by declaring war at a time when the Ottoman mobilization ordered on 1 October was only partially complete. At the time of the declaration of war there were 580,000 Ottoman soldiers in the Balkans facing 912,000 soldiers of the Balkan League. The bad condition of the roads together with sparse railroad network had led to the Ottoman mobilization being grossly behind schedule, and many of the commanders were new to their units, having only been appointed on 1 October 1912. The Turkish historian Handan Nezir Akmeșe wrote that the best response when faced with the Balkan League ultimatum on 15 October on the part of the Ottomans would have been to try to stall for time via diplomacy while completing the mobilization instead of declaring war immediately. Under the tyrannical and paranoid regime of Sultan Abdulhamid II, the Ottoman Army had been forbidden to engage in war games or maneuvers out of the fear that this might be the cover for a coup d'état. The four years since the Young Turk Revolution of 1908 had not been enough time for the Ottoman Army to learn how to conduct large-scale maneuvers. War games in 1909 and 1910 had shown that many Ottoman officers did not know how to efficiently move large bodies of troops such as divisions and corps, a deficiency that General Baron Colmar von der Goltz stated after watching the 1909 war games would take at least five years of training to address. The Ottoman army was divided into two classes; Nizamiye troops who were conscripted for five years; and Redif who were reservists who served for seven years. Training of the Redif troops had been neglected for decades, and the 50,000 Redif troops in the Balkans in 1912 had received extremely rudimentary training at best. One German officer, Major Otto von Lossow serving with the Ottomans complained some of the Redif troops did not know how to handle or fire a rifle. Support services in the Ottoman army such as logistics and medical services were extremely poor. There was a major shortage of doctors, no ambulances, few stretchers and the few medical faculties were entirely inadequate for treating the large numbers of wounded. Most of the wounded died as a result, which damaged morale. In particular, the badly organized transport corps was so inefficient that it was unable to supply the troops in the field with food, who were forced to resort to requisitioning food from local villages. Even so, Ottoman soldiers lived below the subsistence level with a daily diet of 90 grammes of cheese and 150 grammes of meat while having to march all day long, leaving much of the army sickly and exhausted. The heavy rainfall in the fall of 1912 had turned the mud roads of the Balkans into quagmires which made it extremely difficult to supply the army in the field with ammunition, which led to constant shortages at the front. After the 1908 Revolution, the Ottoman officer corps had become politicized with many officers devoting themselves to politics at the expense of studying war. Furthermore, the politicization of the Army had led to the Army being divided into factions, most notably between those who were members of the Committee of Union and Progress and its opponents. Additionally, the Ottoman officer corps had been divided between Alayli (“ranker”) officers who had been promoted up from NCOs and privates and the Mektepli (“college-trained”) officers who had graduated from the War College. After the 1909 counter-revolution attempt, many of the Alayli officers had been purged. The bulk of the Ottoman Army, comprising peasant conscripts from Anatolia were much more comfortable with the Alayli officers than with the Mektepli officers who came from a different social milieu. Furthermore, the decision to conscript non-Muslims for the first time meant that jihad, the traditional motivating force for the Ottoman Army, was not employed in 1912, something that the officers of the German military mission advising the Ottomans believed was bad for Muslim morale. The Treaty of London ended the First Balkan War on 30 May 1913. All Ottoman territory west of the Enez-Kıyıköy line was ceded to the Balkan League, according to the status quo at the time of the armistice. The treaty also declared Albania to be an independent state. Almost all of the territory that was designated to form the new Albanian state was currently occupied by either Serbia or Greece, which only reluctantly withdrew their troops. Having unresolved disputes with Serbia over the division of northern Macedonia and with Greece over southern Macedonia, Bulgaria was prepared, if the need arose, to solve the problems by force, and began transferring its forces from Eastern Thrace to the disputed regions. Unwilling to yield to any pressure Greece and Serbia settled their mutual differences and signed a military alliance directed against Bulgaria on 1 May 1913, even before the Treaty of London had been concluded. This was soon followed by a treaty of "mutual friendship and protection" on 19 May/June 1, 1913. Thus the scene for the Second Balkan War was set. The First Balkan War caused extensive suffering for the noncombatant population in the areas through which the troops passed. The victorious countries resorted to a policy of national and religious assimilation in the newly acquired territories. 50,000 Turks fled the Lozengrad region. In January–February 1913, the Bulgarian Orthodox Church baptized thousands of Pomaks from the Rhodopes and Pirin regions. In Vardar Macedonia, beginning during the autumn of 1912, Serbian authorities put pressure on local people to declare themselves Serbs. The local governments, established by IMRO in Ohrid, Veles and other cities, were disbanded. Bulgarian priests and teachers were persecuted, forced to flee, and replaced by Serbians. Bulgarian schools were closed. Serbian troops carried out a policy of disarming the local militia, accompanied by beatings and threats. Greeks in Southern Macedonia conducted a similar policy to the local Bulgarian and other non-Greek population. During the war, local Muslims and Ottoman soldiers burned and pillaged Christian villages in Southwestern Macedonia. On the other hand, many Turkish villages in the regions of Florina and Kailare (Ptolemaida) were burned by the Greek army and the Muslim population in southwestern Macedonia was subjected to looting and other reprisals. Russia was a prime mover in the establishment of the Balkan League and saw it as an essential tool in case of a future war against its rival, the Austro-Hungarian Empire. However, it was unaware of the Bulgarian plans for Thrace and Constantinople, territories on which Russia itself had long-held ambitions. France, not feeling ready for a war against Germany in 1912, took a totally negative position against the war, firmly informing its ally Russia that it would not take part in a potential conflict between Russia and Austro-Hungary if it resulted from the actions of the Balkan League. The French however failed to achieve British participation in a common intervention to stop the Balkan conflict. The British Empire, although officially a staunch supporter of the Ottoman Empire's integrity, took secret diplomatic steps encouraging the Greek entry into the League in order to counteract Russian influence. At the same time it encouraged the Bulgarian aspirations over Thrace, preferring a Bulgarian Thrace to a Russian one, despite the assurances it had given to the Russians in regard of their expansion there. Austria-Hungary, struggling for an exit from the Adriatic and seeking ways for expansion in the south at the expense of the Ottoman Empire, was totally opposed to any other nation's expansion in the area. At the same time, the Habsburg empire had its own internal problems with the significant Slav populations that campaigned against the German–Hungarian control of the multinational state. Serbia, whose aspirations in the direction of the Austrian-held Bosnia were no secret, was considered an enemy and the main tool of Russian machinations that were behind the agitation of Austria's Slav subjects. But the Habsburgs failed to achieve German backup for a firm reaction. Initially, Emperor Wilhelm II told the Archduke Franz Ferdinand that Germany was ready to support Austria in all circumstances – even at the risk of a world war, but the Austro-Hungarians hesitated. Finally, in the German Imperial War Council of 8 December 1912 the consensus was that Germany would not be ready for war until at least mid-1914 and notes about that passed to the Habsburgs. Consequently, no actions could be taken when the Serbs acceded to the Austrian ultimatum of 18 October and withdrew from Albania. The German Empire, already heavily involved in the internal Ottoman politics, officially opposed a war against the Empire. But in its effort to win Bulgaria for the Central Powers, and seeing the inevitability of Ottoman disintegration, it was playing with the idea to replace the Balkan positions of the Ottomans with a friendly Greater Bulgaria in its San Stefano borders—an idea that was based on the German origin of the Bulgarian King and his anti-Russian sentiments. Finally, when Serb-Austrian tensions again grew hot in July 1914 when a Serbian backed organization assassinated the heir of the Austro-Hungarian throne, no one had strong reservations about the possible conflict and the First World War broke out. ^ Hellenic Army General staff: A concise history of the Balkan Wars, page 287, 1998. ^ Noel Malcolm, A Short History of Kosovo pp. 250–251. ^ “Correspondants de guerre”, Le Petit Journal Illustré (Paris), 3 novembre 1912. ^ Balkan Harbi (1912–1913) (1993). Harbin Sebepleri, Askeri Hazirliklar ve Osmani Devletinin Harbi Girisi. Genelkurmay Basimevi. p. 100. ^ Dimitrova, Snezhana. Of Other Balkan Wars: Affective Worlds of Modern and Traditional (The Bulgarian Example). In: Perceptions: Journal of Foreign Affairs, Ankara, 2013, p. 29. ^ Erickson, Edward (2003). Defeat in detail : the Ottoman army in the Balkans, 1912–1913. Westport, Conn.: Praeger. p. 226. ISBN 0275978885. ^ Stowell, Ellery Cory (2009). The Diplomacy Of The War Of 1914: The Beginnings Of The War (1915). Kessinger Publishing, LLC. p. 94. ISBN 978-1-104-48758-4. ^ Somel, Selçuk Akşin. Historical dictionary of the Ottoman Empire. Scarecrow Press Inc. 2003. lxvi. Erickson, Edward J. (2003). Defeat in Detail: The Ottoman Army in the Balkans, 1912–1913. Westport, CT: Greenwood. ISBN 0-275-97888-5. Fotakis, Zisis (2005). Greek Naval Strategy and Policy, 1910–1919. London: Routledge. ISBN 978-0-415-35014-3. Hooton, Edward R. (2014). Prelude to the First World War: The Balkan Wars 1912–1913. Fonthill Media. ISBN 978-1-78155-180-6. Langensiepen, Bernd; Güleryüz, Ahmet (1995). The Ottoman Steam Navy, 1828–1923. London: Conway Maritime Press/Bloomsbury. ISBN 0-85177-610-8. Pettifer, James. War in the Balkans: Conflict and Diplomacy Before World War I (IB Tauris, 2015). Schurman, Jacob Gould (2004). The Balkan Wars, 1912 to 1913. Whitefish, MT: Kessinger. ISBN 1-4191-5345-5. Seton-Watson, R. W. (2009) . The Rise of Nationality in the Balkans. Charleston, SC: BiblioBazaar. ISBN 978-1-113-88264-6. Trix, Frances. "Peace-mongering in 1913: the Carnegie International Commission of Inquiry and its Report on the Balkan Wars." First World War Studies 5.2 (2014): 147-162. Uyar, Mesut; Erickson, Edward (2009). A Military History of the Ottomans: From Osman to Atatürk. Santa Barbara, CA: Praeger Security International. ISBN 978-0-275-98876-0. Stojančević, Vladimir (1991). Prvi balkanski rat: okrugli sto povodom 75. godišnjice 1912–1987, 28. i 29. oktobar 1987. Srpska akademija nauka i umetnosti. Ratković, Borislav (1975). Prvi balkanski rat 1912–1913: Operacije srpskih snaga [First Balkan War 1912–1913: Operations of Serbian Forces]. Istorijski institut JNA. Belgrade: Vojnoistorijski Institut. Ćirković, Sima (2004). The Serbs. Malden: Blackwell. Jelavich, Barbara (1983). History of the Balkans: Twentieth Century. II. Cambridge University Press. Wikimedia Commons has media related to First Balkan War. Hall, Richard C.: Balkan Wars 1912–1913 , in: 1914-1918-online. International Encyclopedia of the First World War.